INSTEAD of putting a fight for the World Cup of World Cup games, Codemasters seems content to put in a stick together job in the hope of catching some glory. Admittedly, for the money you are getting a lot of game, but when it is this bad that sort of thinking seems to be redundant. The game is split into two sections - the match and the training. This would be slightly good, even brilliant, if the training affected the skill and abilities of the players on the pitch, but it seems more a case of the Daley Thompsons. About all that can be said for the match is that the graphics are not that bad. Well, not horrendously bad anyway. Until they move that is. At least it has a four player mode, if you can find four people bored enough. There are bound to be more of these in the run to the World Cup, so get used to them. This one offers four players the chance to take part in the finals as I as having a bash at some circuit training and indulging in some outdoor skill practice. 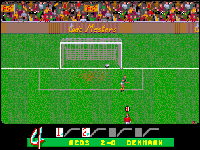 The actual match section is viewed from almost above and allows the player control of the nearest team member to the ball - you can switch to another player by hitting the fire button. The game looks all right but plays awfully badly. The sluggishness you can live with and you can even put up with the weird scroll, which sometimes lags far behind the action - but what really screws the game up is the inability to alter the direction of your player once you have pressed the fire button for a shot. Spend a few minutes learning how to get round that, though, and the three matches you play in solo mode become ridiculously easy to win. Even with a couple of mates playing, it is really not up to much. The circuit training and the skill practice do little to redeem the game, which is also a shame. The nicest thing to be said is that Codemasters have not, at least, overcharged for the game. Die Fußball-Weltmeisterschaft steht vor der Tür, da lassen die enschlägigen Computer-Umsetzungen natürlich nicht lange auf sich warten! Codemasters haben mit ihrem Soccer-Game schon mal den Anfang gemacht. Es entpuppt sich sehr schnell als ein Soccer-Game wie tausend andere auch; erwähnendswert sind eigentlich nur die besonders kleinen Spielfiguren und die Einfachheit des Ganzen - Gewinnen ist kein Problem! Ansonsten: ein bis vier Spieler (bei vier Teilnehmern müssen sich allerdings zwei mit der Tastatur zufrieden geben - würg! ), Highscores(! ), Spieldauer einstellbar von 5 bis 90 Minuten, und wer mag, kann sich einen automatischen Torwart zulegen. Außerdem ist sportliche Fairneß Trumpf - Fouls gibt es nämlich einfach keine! Im Trainingsteil kann man Sprinten, Umgang mit dem Ball und Elfmeter üben oder diverse Gymnastikeinlagen absolvieren. Steuerung oder Teamnamen ändern geht auch hier, nur die Teilnehmerzahl ist diesmal auf zwei beschränkt. Die Grafik ist nur an manchen Stellen gut, im allgemeinen wird sie dem Amiga kaum gerecht. An Sound werden mittelmäßige Musik und spärliche FX geboten. In beiden Teilen ist die Steuerung durchdacht, hätte aber besser umgesetzt werden können. Spezialität: Wer zwischen Spiel und Training wechseln will, hat nur eine Wahl: rebooten! David: With the World Cup being played in Italy this Summer, it was a pretty safe bet to expect eight trillion footie games to appear on the market. Here's the Codies' offering, cunningly title Italia '90. It's actually two games in one, for not only is there the usual arcade footy game where you play against the computer or a chum, or you and a chum both play the computer, but also a training game. This has an indoor part where you joystick waggle against the clock or a pal, performing sit-ups, press-ups, et cetera, and an outdoor section where you can run the pitch, dribble around cones and practice penalties (both as keeper and taker). Okay so the matchplay may be a poor man's Kick Off and has a few graphic glitches, but with extra options, an additional game, and at a quarter of the price of the aforementioned classic, it's not bad at all.